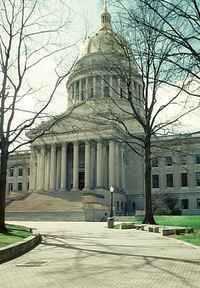 The West Virginia State Capitol has been characterized as “the requiem for American Renaissance capitols.” [Hitchcock-Seale-1976 p 217] After a fire burned down the existing capitol in 1921, a state commission was authorized to select an architect for the design of a new capitol. According to Cass Gilbert, Jr., recently returned from World War I and starting to work in his father's office, it was his idea to seek the commission. [Hitchcock-Seale-1976 p 272] The Gilbert firm was selected, which launched a multi-year capitol complex project, largely carried out under the supervision of the younger Gilbert. Gilbert recommended the site, about two miles west of the old capitol site, facing the Kanawha River with the mountains as a backdrop. Gilbert's building scheme was for a central capitol structure flanked by perpendicular office wings to house legislative and administrative offices and the West Virginia Supreme Court of Appeals. Work began first on the office wings, with the west wing being constructed in 1924-1925 and the east wing in 1925-1927. The east wing houses the Supreme Court of Appeals. 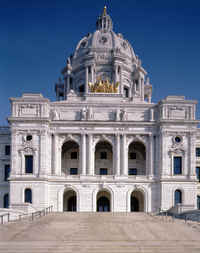 The domed capitol section itself was constructed in 1930-1932. The building was dedicated on June 20, 1932, the sixty-ninth anniversary of West Virginia statehood. The buildings of the capitol complex are faced with Indiana limestone over a structural steel frame. 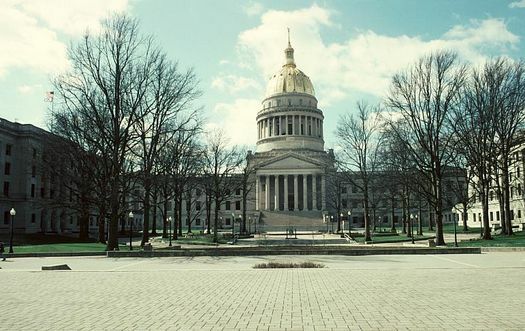 Like the predecessor capitols Gilbert designed for Minnesota and Arkansas, the West Virginia capitol is dominated by its dome, which rises 292 feet above a colonnaded drum, and is embossed with gold leaf. The design was inspired by that of the Pantheon in Paris. The main entrances to the building are through monumental pedimented Corinthian porticos, set below the dome. Shallow domes at the ends of the main capitol block mark the location of the legislative chambers. The interior walls are faced with Vermont marble. The floor of the rotunda below the main dome is of Italian and Vermont marble. A two-ton crystal chandelier, eight feet in diameter, is suspended from the dome. 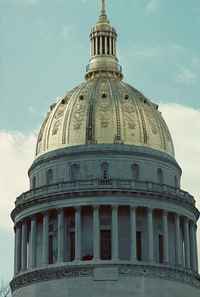 In 2007, West Virginia celebrated the seventy-fifth anniversary of its capitol. The dome had been restored in 2005-2006 by Swanke Hayden Connell Architects of New York.